Nauru Airlines is pursuing the fastest growth in the company’s 18-year history, adding three aircraft during 2014. The government-owned flag carrier also recently completed a rebranding, taking back the Nauru name following an eight year hiatus with the more generic name Our Airline. The rebranding and growth come as part of an increased focus on its home market. Nauru, the second least populated nation in the world after the Vatican, has a minuscule home market and no tourism. But Nauru is receiving increased traffic as the island is used by Australia to process asylum seekers offshore. Nauru Airlines also continues to run a niche wet lease and charter business, enabling the carrier to be profitable despite its tiny size and isolated location. In the process it has been able to enhance sub-regional air service links on the long, thin inter-island routes in the south and central Pacific. This report also covers the role of the Cook Islands' Air Rarotonga. 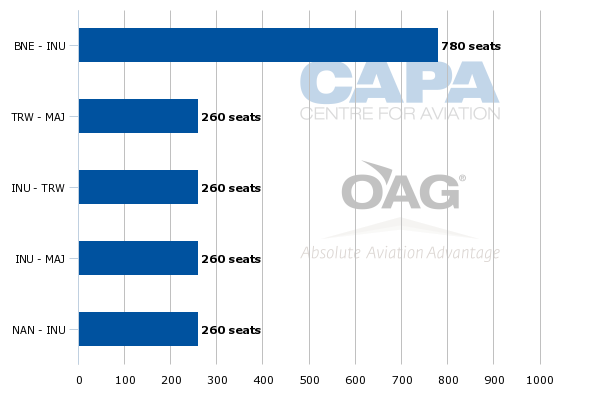 This is the last in a series of 10 analysis reports published by CAPA on subjects and airlines that were featured at the CAPA Australia Pacific Aviation Summit in Aug-2014. The next CAPA Australia Pacific Summit will take place 29/31-Jul-2015. For information on all of CAPA’s events, including the Asia Aviation Summit and LCC Congress in Singapore on 13 to 15-Oct-2014, visit the CAPA Events website. Nauru first established a flag carrier back in 1996 with an operator’s certificate from the Australian Civil Aviation Safety Authority (CASA). In its heday it operated an ambitious schedule of sixth freedom operations, linking Australia with some of the smaller islands and nations in the central Pacific under the Air Nauru brand. In 2005 the airline's sole aircraft was repossessed as the country - whose economy had been based on phosphate mining - went bankrupt. But the airline quickly rebounded and relaunched in 2006 with a single 737 under the new brand Our Airline and a new business model focusing on wet leases and charters for small South Pacific nations which had no services of their own. A second 737 was added in 2009 after securing a three-year deal to operate an aircraft between the Australian mainland and Norfolk Island on behalf of Norfolk Air, which ceased operations in 2012. Our Airlines’ fleet stayed at two aircraft until Apr-2014, when a third 737-300 and its first freighter was added. The airline added a fourth 737-300, giving it three passenger aircraft, in Aug-2014 as it rebranded to Nauru Airlines. Nauru Airlines CEO Geoff Bowmaker said at the Aug-2014 CAPA Australia Pacific Aviation Summit that the fleet will grow to five 737-300s by the end of 2014. The third addition of 2014, a passenger aircraft acquired from Air New Zealand (which is also the source of the most recent addition), is expected to be delivered in Nov-2014. The expansion is mainly driven by growth in the local Nauru market. The Nauru market, which is not served by any foreign carriers, was barely able to support one weekly flight during the country’s financial crisis in 2005. But now the market is able to support several flights, primarily to Brisbane in Australia. Nauru Airlines has been the beneficiary of a surge in local demand driven by the role Nauru provides for the Australian government in housing asylum seekers. Nauru Airlines now operates at least 11 flights every week from Nauru, including eight flights to Brisbane, two to Kiribati and the Marshall Islands and one to Fiji. The Brisbane flights include four scheduled flights (three passenger and one cargo) as well as four regular charters (two passenger and two cargo). The Brisbane charters are for contractors that run the offshore processing centres on Nauru for the Australian government. Nauru Airlines also operates ad hoc charters for these contractors, including occasional flights from Darwin which transport the asylum seekers. The scheduled flights to Majuro in the Marshall Islands, Tarawa in Kiribati and Nadi in Fiji have been added as part of an initiative to provide new north-south links within the South Pacific, where regional routes are almost entirely east-west. Previously to travel between the islands long circuitous journeys west to Guam or east to Hawaii were required (although in its earlier incarnation, Air Nauru did serve these points). Nauru Airlines currently operates one weekly return flight from Nauru to Nadi, one weekly flight on a Nauru-Majuro-Tarawa triangle routing and one weekly flight on a Nauru-Tarawa-Majuro triangle routing. The Majuro and Tarawa flights are scheduled so that they connect with both Brisbane and Nadi, providing important inter-island links as well as access to Australia for the Marshall Islands and Kiribati. Nauru Airlines is currently one of only two airlines operating scheduled services at both Majuro and Tarawa, according to OAG. Fiji Airways is the only other airline at Tarawa, operating two weekly flights from Nadi. United, previously Continental Micronesia, serves Majuro with three weekly flights on a Honolulu-Majuro-Kwajalein-Majuro-Honolulu routing (Kwajalein is also located in the Marshall Islands). Mr Bowmaker said Nauru Airlines is now discussing a new inter-island link with the Federated States of Micronesia. He expects the new service to be launched in late 2014 or early 2015, at which point Nauru Airlines will have received its fourth 737-300 passenger aircraft. The Micronesia service would further improve links within the South Pacific. United currently is the only airline serving Micronesia, according to OAG data. United links all four of the Micronesia islands with airports – Chuuk, Kosrae, Pohnpei, and Yap – with Guam and the Marshall Islands. Nauru Airlines is expected to link Nauru with Pohnpei. Nauru Airlines also continues to offer wet lease options for island governments that seek to establish an airline but do not want to invest in acquiring and operating an aircraft. This is the model Nauru Airlines has extensive experience with, having relied almost entirely on wet leases and charters for several years when its local market was struggling. About half of Nauru Airlines’ business continues to come from charters and wet leases although the focus on scheduled operations at Nauru has increased significantly. The launch of a cargo operation earlier this year further diversified Nauru Airlines’ business while helping provide scale to the operation as the freighter is also a 737-300. In addition to the scheduled and regular charter flights to Brisbane, the freighter is used on ad hoc charters in the Australia and South Pacific markets. As it is regulated by CASA and operates Australian registered aircraft, Nauru Airlines is able to compete in the domestic Australian market for cargo and passenger charters. One of its most frequent charter routes is from Brisbane to Gladstone on behalf of a fly-in fly-out mining customer. While being able to supplement its work in the South Pacific is important to its viability, Nauru Airlines has to compete aggressively with Australian carriers to win work within Australia. “That is where our real competition is,” Mr Bowmaker said. The flag carrier’s ability to survive the financial crisis in Nauru and now generate enough business to operate five aircraft is a remarkable achievement. Nauru Airlines has been profitable in recent years, providing a return to its government shareholder. Nauru has a population of only about 10,000 residents, which makes it the second smallest country in the world after Vatican City. Nauru Airlines provides a critical service to the local population, providing a steady flow of ethnic or visiting friends and relatives (VFR) traffic. But its biggest segment is business traffic, which is driven primarily by the processing centre. Unlike other South Pacific countries Nauru has no tourism and virtually no potential to develop tourism as the island was depleted by phosphorous mining in the 1970s and 1980s. Nauru at one point in the 1970s had the second highest GDP per capita in the world. The country’s economy is now heavily dependent on the Australian processing centres. These were closed from 2008 to 2012 but over the past two years they have expanded rapidly as result of a new Australian policy mandating third country processing of asylum seekers arriving by boat. Nauru Airlines has clearly been a beneficiary of this policy but should be credited with surviving a crisis which in most similar cases has relegated small flag carriers to the history books. Under the Our Airline name, Nauru’s flag carrier carved out a sustainable albeit small niche. With the Nauru local market back its niche is now larger (although still small) and its outlook is brighter. In this new light, Air Nauru is also able to serve a valuable role in linking small and very isolated island communities in the region. Expanding the fleet by 150% in a single year is a huge step for Nauru Airlines. But acquiring three 737 Classics is a relatively modest investment and the expansion provides important scale to a very small airline from an often forgotten part of the world. Another CEO of a small South Pacific carrier, Air Rarotonga’s Ewan Smith, also spoke at the Aug-2014 CAPA Australia Pacific Aviation Summit. Air Rarotonga only operates domestically with a fleet of one Saab 340 and three Embraer EMB110 Bandeirante turboprops. But Mr Smith also oversees the Cook Island Government’s cost-plus contract with Air New Zealand covering services to Los Angeles and Sydney. Air NZ’s weekly Rarotonga-Los Angeles service will be upgraded in 2015 from 767s to 777-200s as Air NZ phases out its 767 fleet. The up-gauge to 777s will provide an opportunity to increase visitor numbers from the US as seat capacity increases by 30%. But the upgrade also comes with a higher cost as the Cook Islands Government underwrites the entire cost of the Los Angeles flight as well as Air NZ’s weekly flight from Rarotonga to Sydney. Rarotonga is also served from Auckland by both Air NZ and Virgin Australia but these flights are purely commercial and do not require any government support. Air NZ uses its own distribution channels to sell the Los Angeles and Sydney flights but has a codeshare with Air Rarotonga on domestic connections. Mr Smith says 90% of passengers arriving in Rarotonga from Los Angeles connect to the popular island destination of Aitutaki. About 65% of Sydney passengers also connect to Aitutaki but 90% of passengers from Auckland stay in Rarotonga as New Zealanders ("Kiwis") generally holiday for shorter periods. Air Rarotonga currently operates 26 weekly flights to Aitutaki mainly using its Saab 340A, according to OAG data. The airline uses the smaller Bandeirantes to link Rarotonga with several smaller airports that only have coral runways. Mr Smith said the Saab 340A will likely be replaced with Saab 340Bs in the “not too distant future”. There are no suitable replacements for the Bandeirantes but Air Rarotonga’s Bandeirantes have relatively low cycles and should be able to continue operating for at least several more years. Note: CAPA TV interviewed 14 airline executive during last month’s CAPA Australia Aviation Pacific Summit, including 10 CEOs. Too watch all the videos visit the CAPA TV website.